Baked to commemorate World Teacher’s Day this is definitely an apple for the teacher he or she would love to receive. Those of you who know me well will realise that this is a post close to my heart. I am a primary school teacher myself. I trained 21 years ago but had time out to bring up my children. I worked as a TA in a fantastic primary school for 8 years doing supply teaching alongside it. But this time last year I decided to take the plunge and leave my regular job to take up day to day supply. Apart from the uncertainty of work at the beginning of the school year I am very busy and would not change it for the world. What I do find upsetting and have done for years is that in other countries on the whole it seems that teachers are treated with respect. This doesn’t seem to be the same in the UK. I get sick and tired of all the “start at 9 and finish at 3” jokes and about all the long holidays we get. The funny thing is though, these complaining types are the sort who wouldn’t last 5 minutes in a classroom and if it’s so easy for the teachers with their cushy hours then why aren’t you doing it yourself? Teacher bashing seems to be a great past time and for the record, no we don’t sit around drinking coffee all day on training days! Boring….. anyway I love being a teacher and it is hard work when you feel like you are juggling about 20 balls in the air. Apart frombaking I would never consider another career. So when I opened the October chapter of The Clandestine Cake Club’s new cookbook “A Year Of Cake” it was a big surprise to see a recipe commemorating World Teachers Day. I’ve never even heard of this day, it was created in 1994 funnily enough that was the year I qualified. So why haven’t I heard of this day before? UNESCO created World Teachers’ Day to raise awareness of the essential role that teachers play in the education of future generations and encourages support to make sure that children all over the world have access to quality education. As a teacher I have always been over the moon with beautiful gifts and gorgeous cards that pupils have given me at the end of term or at Christmas. I always appreciate them and keep all my cards in a special drawer in my spare room. I treasure my memory book I was given when I left my last job although I do end up crying when I read all the lovely comments in it. 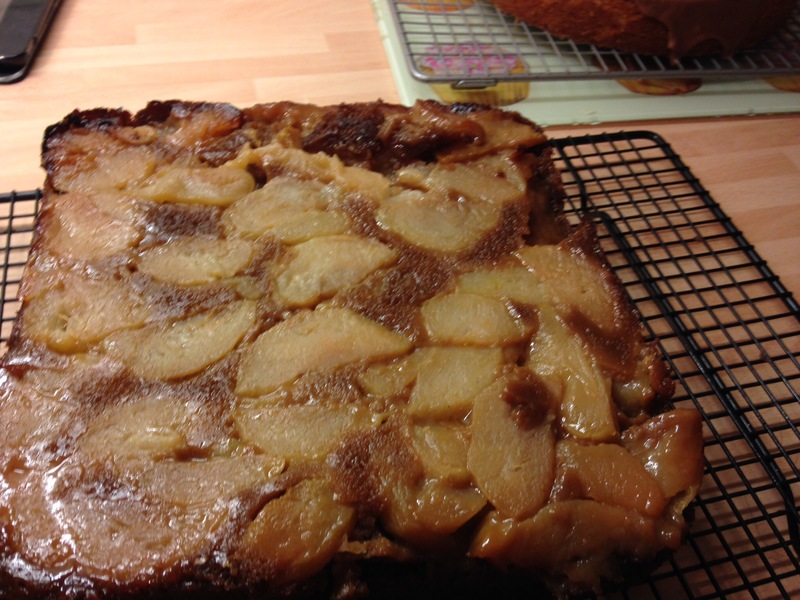 It has always been a tradition or a saying “an apple for the teacher” and I was only too keen to try Yin Li from Leeds Clandestine Cake Club’s delicious sounding Toffee Apple Gingerbread recipe from “A Year Of Cake”. Perfect for this time of year with apples being harvested and also toffee apples are synominous with Halloween and Bonfire Night time. 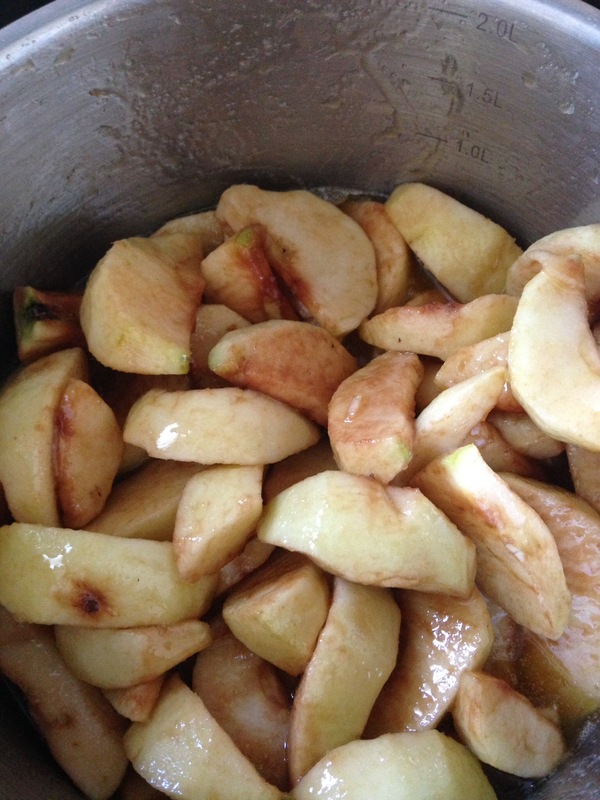 Yin Li suggests using a crisp type of eating apple in the recipe, such as a Granny Smith. I had loads of Bramley cooking apples to use up and I thought as they were being softened to caramelise them it wouldn’t matter. They would be sweetened by the amount of sugar being added to them. To make the toffee apple base I melted butter and sugar in a large frying pan. When this was done I added sliced apples to the pan and softened them for about 5 minutes. There seemed to be a lot of juice coming out of them. The Toffee Apple Gingerbread needed 6 Granny Smith applles but i didn’t have any, only some Bramley Apples my mum gave me. The apples were removed from the heat and then allowed to cool down while I made the gingerbread itself. First I sifted flour, bicarbonate of soda, ginger, cinnamon and mixed spice together in a large bowl. Then cubes of butter were rubbed in so it turned into fine breadcrumbs. I then put treacle and golden syrup into a saucepan and heated it through so it became runny but not bubbling away. In another pan I then put muscovado sugar and milk to warm through. Once all this was done I then whisked the milk mixture into the flour mixture beating it carefully. Finally the treacle mixture was added. I got the tin ready. I used a 20cm square tin with a loose bottom and greased and lined it carefully. It needed to be lined as the toffee sauce with the apple mixture might leak out of the bottom if you weren’t careful. 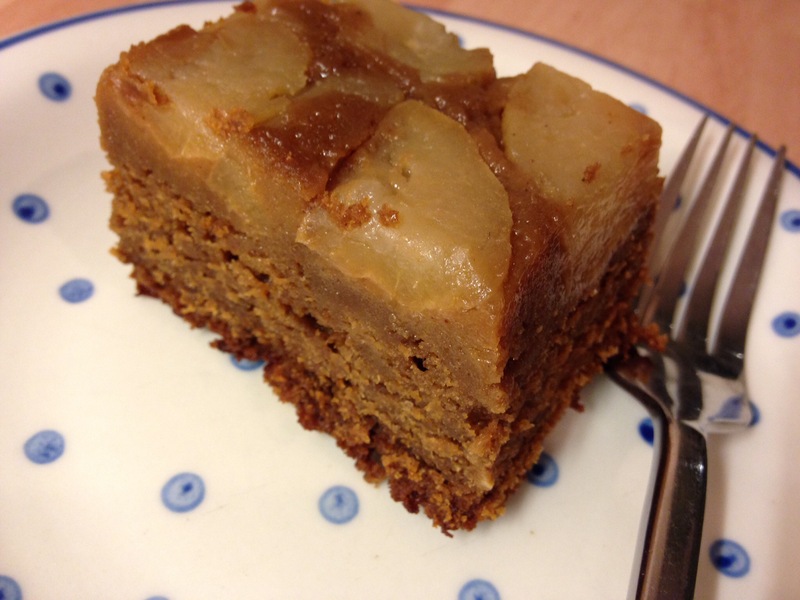 The apple layer was placed on the bottom and then the gingerbread mixture spooned carefully on the top. Yin Li says the gingerbread could be served in different ways, either as a tarte tatin with the apple layer on top of the cake inverted out of the tin or you could eat it so that the apple layer is a surprise on the bottom. I inverted the gingerbread myself so it was like an upside down cake and cut it into squares. Along with the Chocolate Orange Cake I’d baked earlier I took the gingerbread to work with me and hoped it would go down well. The top of the gingerbread was very moist and sticky. The gingerbread was cut into 12 pieces and taken in a box to work tne folllowing day. I’m not sure what everyone thought of the gingerbread as everyone took slices of the chocolate orange cake. I had a piece of the gingerbread myself and I really enjoyed it. You could taste the spices coming thorough and they worked perfectly with the apple flavour. Perfect for a cold autumn day and would be ideal for a Sunday lunch pudding finished off with a scoop of vanilla ice cream. I’ll definitely be baking this again! Previous Post Chocolate Orange Marble Cake from “A Year Of Cake” Celebrating World Mental Health Day.